Did you even know that we have a basement in our home? I never mention it and never post pictures about it because it had simply become an abyss. 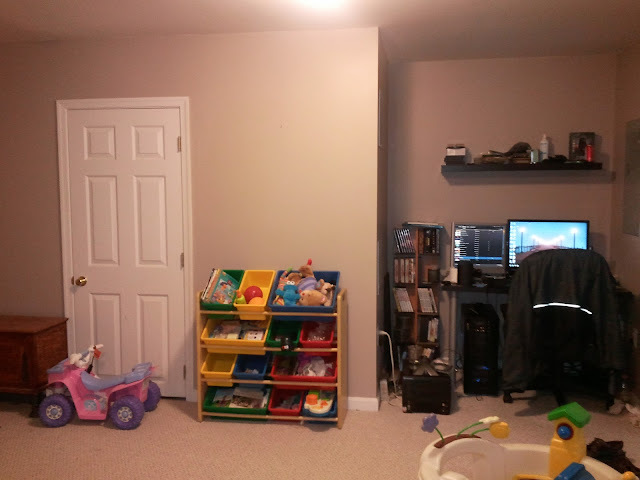 Originally slated to be Adam's "man-cave", he let it just sit there for over a year with various piles of random computer parts collecting dust. I decided that just wasn't going to hack it, and I wanted to use the basement as actual living space! In an effort to keep my main floor more tidy, I decided the solution to my problem was to transport most of Autumn's toys to the basement. I had it all planned out in my head - I knew where I wanted the furniture, what kind of storage I wanted, etc. First, I had to convince Adam to finally find a home for all his piles of "stuff". We moved out all of my crafting supplies and I said goodbye to my old scrapbooking supplies, as Shutterfly and I have formed a relationship that simply cannot be broken. Huzzah! The entertainment center is from IKEA, as well as the boxes ($2.99 + $1 for the lid), and easel. We moved the play kitchen down from the actual kitchen upstairs, and the red rug we inherited from the former tenants of our old apartment in Utah. If you look closely, you can see the pattern of our awesome couch. We ditched the slip cover (I hate slip covers...) and decided to embrace the ugly. The labels are images of the categories Autumn's toys fell into (people, dress up, cars, etc.) with pictures from Google Images. They are printed and laminated, and adhere to the container with velcro. That way they can easily be moved or replaced! This nook in the corner is what remains of Adam's "man-cave". He never leaves the corner anyway, he really the basement space was wasted on him... We moved the toy shelf down from the living room, which we inherited from my sister in law Chelsey. The plastic playhouse in the front corner was a hand me down from my sister Jodi, and the pink Barbie car was a donation to the Brewer family from a friend at Church =) The door you see goes to the furnace - fascinating, I know. Another view of our basement. The chest was a $20 Craigslist find in Utah, which I sanded, stained and refinished. It holds our vast collection of board games. The two doors on the left contain the "bathroom" (plumbed, but unfinished and serves as a tool/computer part/food storage room and the door directly across from the stairs is our massive storage room. 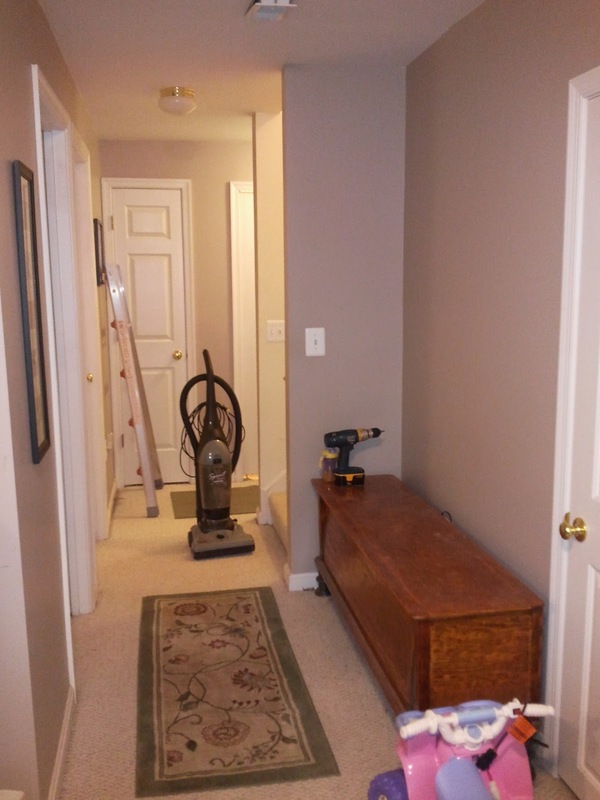 The washer and dryer are immediately to your right when coming down the stairs! So there you have it. It is amazing how much bigger my house feels now that we're fully using all the space in it. We put in a TV in the basement (along with cable!) and I can already foresee a lot of time spent down there this summer, as it will easily be the most cool place in the house. All the remains now is to put some pictures up on the wall and it will be finished! I always love how cold basements are in the Summer. Not so much in the winter... but I'm totally jealous of all the space. Having all our toys in the basement...love it. Good for you! Yet another successful Kelli Brewer makeover! Looks great! I love it, Kelli! 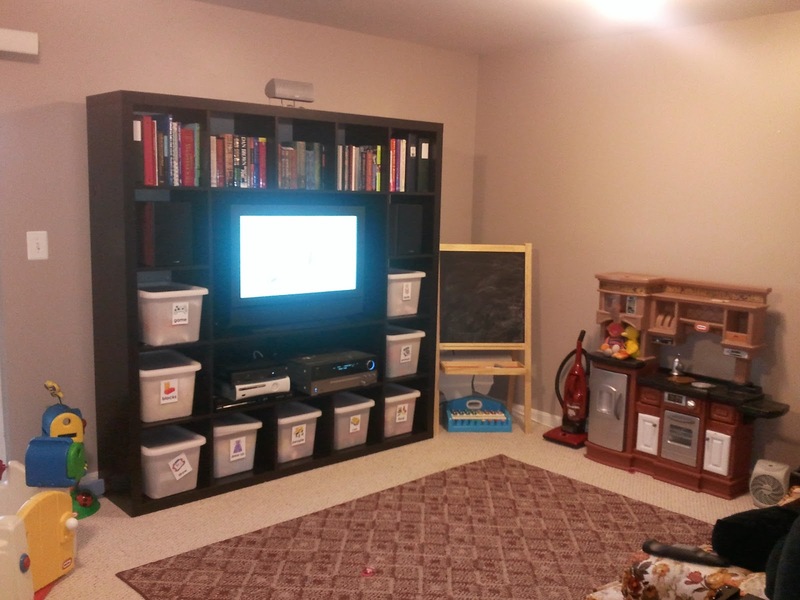 I've been wanting to reorganize/clear out our basement as well. We'll have to see if that happens/how soon. Congrats to you!